Mumbai to get pizza-on-the-go at five local train stations To satiate the hunger pangs of the Mumbaikars travelling in local trains, IRCTC has announced installation of instant pizza vending machines at five major stations. Passengers travelling to or from Kalyan, Lokmanya Tilak Terminus (LTT) in Kurla, Andheri, Mumbai Central and CST will be able to enjoy thin-crust pizzas prepared within five minutes from the 'transparent' vending machines. You can also see the whole process of pizza making - right from kneading the dough to baking. Promoting Kashmiri dry fruits In an attempt to help the Self Help Groups (SHGs) of Jammu and Kashmir, IRCTC will facilitate the sale of dry fruits from the state by setting up sales outlets in Katra and Jammu railway stations. Customers will also be able to buy the dry fruits from IRCTC's e-commerce site and from the Jan Aahar facility. Book your train ticket via Paytm now You can now book you train tickets through mobile-wallet service Paytm's website and app. Paytm has been offering bus bookings and air ticketing since 2012 and 2016 respectively, now with allowing train ticket booking, they are close to becoming the largest travel booking platform. Travel insurance for train passengers Passengers booking train tickets from IRCTC's website can now opt for travel insurance cover from the month of September. The premium is just Re 1/- , available for all classes. This option is available for all the passengers except for the ones traveling in sub-urban trains. For now, this is on a trial basis. The compensation includes- Rs 10 lakh in the event of death/permanent total disability,Rs 7.5 lakh for permanent or partial disability, upto Rs 2 lakh for hospitalisation expenses, Rs 10,000 for transportation of the mortal remains in the event of death or injury from a train accident or other 'untoward incident' which includes terrorist attacks, dacoity, rioting, etc. One can choose the option while booking tickets online. 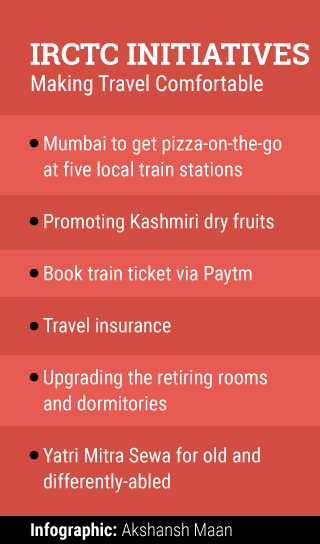 Upgrading the retiring rooms and dormitories In order to improve its services and provide better comfort, IRCTC is set to upgrade the retiring rooms with 'top-class' offerings. This will include well-furnished and air conditioned rooms apart from the integrated sigh-seeing and travel services. The management and operation of dormitories and running rooms are now going to be handled by IRCTC. Yatri Mitra Sewa for old and differently-abled Yatri Mitra Sewa has been introduced for providing assistance to old and differently-abled passengers at stations. It will be managed by IRCTC. You can book this service on the website or by calling or sending SMS to 139. It includes providing wheel-chair and porter services to the concerned old people. It is not yet confirmed whether it will be availed free of cost or will be chargeable.